Waiting for our bus to leave Sarajevo. 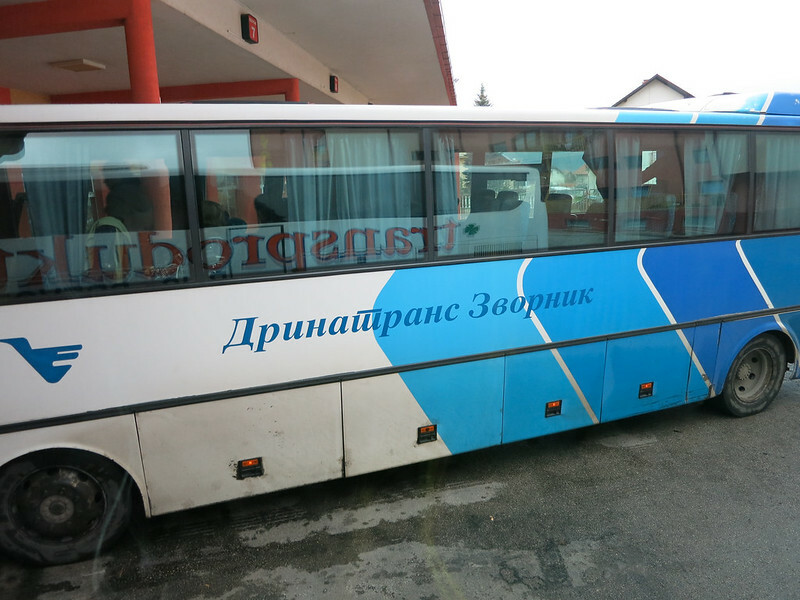 If you’re traveling through the Balkans by bus, there a few things you should know. The most important thing is that the people here are late for everything, they cannot sit on a bus for more than an hour at a time and timetables seem to be a mere suggestion and not something anyone takes seriously. By the time we took the seven hour bus ride from Sarajevo to Belgrade, we had armed ourselves with blog posts about this ride. Some lamented the seven hour ride which actually ended up taking nine+ hours, while others talked about the driver nodding off as he maneuvered himself around curvy, narrow mountain paths. We mentally prepared ourselves to never get to Belgrade alive, bravely approached the surly woman behind the ticket sales counter and bought 20 euro tickets for the old-school Transprodukt bus. We left late, but at least it was only by about 15 minutes. It was a cold Wednesday morning and we handed our backpacks to the driver, a towering man (did we mention that the Balkan people are enormously tall?) who gruffly threw our stuff under the bus. We settled into the cold bus with seven other passengers and we were off. It was a foggy, overcast day. We stopped constantly. I mean, we stopped after about 10 minutes to pick up a couple of girls off the side of the road, and then again 10 minutes later to pick up a few more people. We stopped an hour into the ride for 30 minutes at some random bus station, where N had to deal with the “Turkish style” (squat) toilets. After another hour, we stopped again by a restaurant on top of a mountain for a 30-minute lunch break. I needed to use the bathroom, and of course, there was no toilet on this bus. 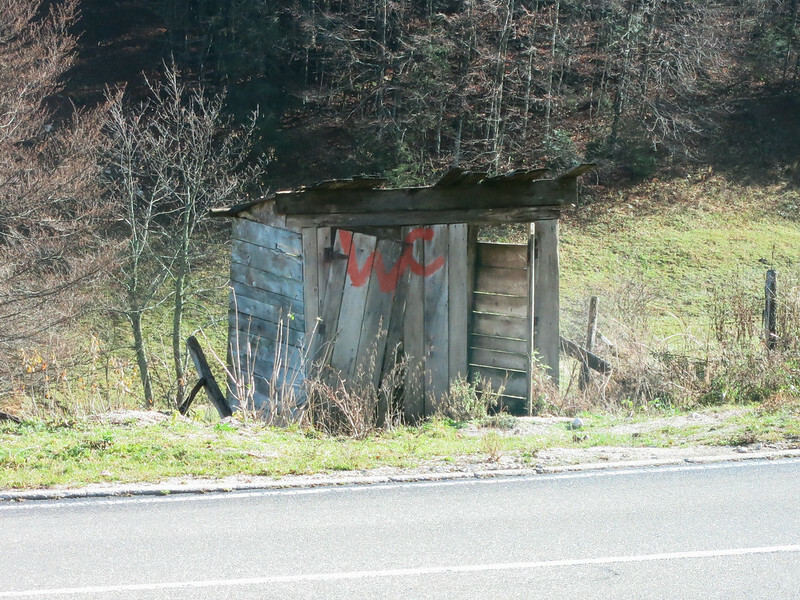 I watched as an older man went inside the restaurant, came back out and ambled over to a wooden shack perched on the edge of the road with the letters “WC” painted on two of its barely-hinged doors. Oh hell no. 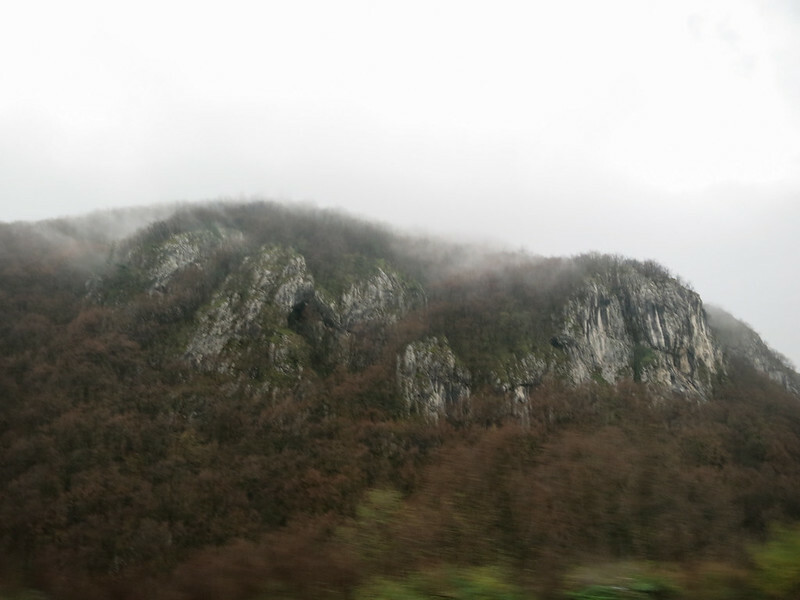 Beautiful scenery on the bus ride from Mostar to Sarajevo. 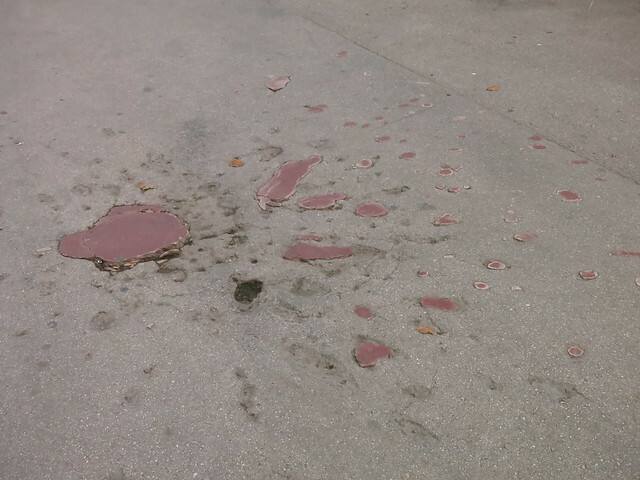 I have mixed feelings about Sarajevo. We had heard that it was a great city and a lot of fun from people that we met while we were in the Balkans, but we had some negative experiences with ignorant, racist assholes that left a bad impression on us. I usually wouldn’t let a bigot ruin a great experience for me, but it’s not like the city itself had much to offer and it wasn’t just one bigot that we encountered. I’ll talk about the good before the bad. Historically speaking, Sarajevo is definitely interesting. It’s the site where Archduke Franz Ferdinand was assassinated thus sparking World War I. Now, I think that’s pretty darn significant. 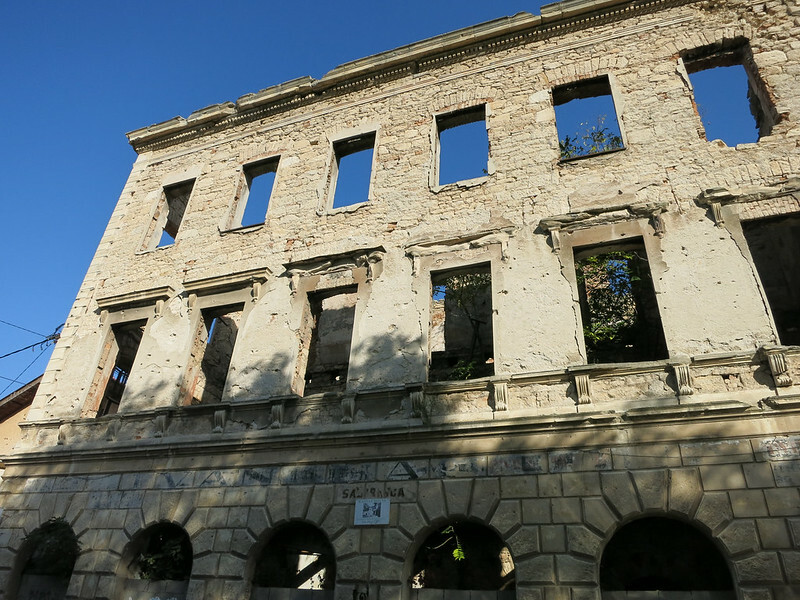 It also withstood the longest siege in modern history when the Bosnian Serb Army shelled the city for almost four years during the Bosnian War. I only learned about that when we were in the city and took the Tunnel Tour to understand more about the city’s war-torn past. I’m not big into tours, but it was the best way to educate ourselves in a short period of time. 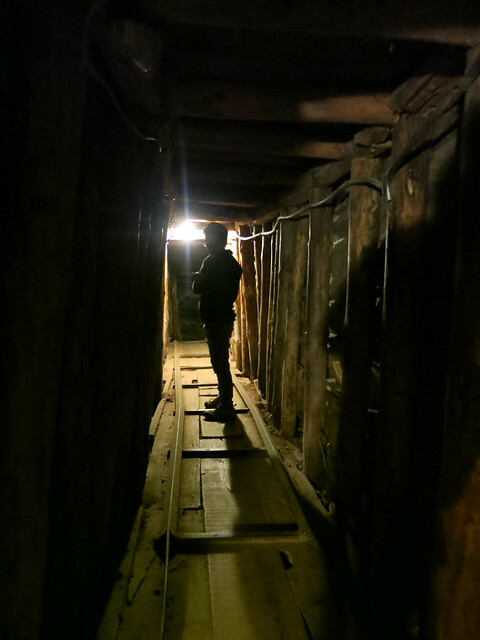 If you find yourself in Sarajevo, you should make time to check out the Tunnel Tour. It’s an important part of understanding the hardships that the civilians of the city had to endure during the years long siege. It still blows my mind to think this happened in the 1990’s, but I guess it shouldn’t be that big of a surprise considering what’s still going on today in parts of the world. Ah, my sheltered life. A Sarajevo Rose that we found on a sidewalk near the Main Park. These are actual sites where at least one civilian was killed by a mortar shell during the war. Red resin was used to fill in the spots sometime after the war. 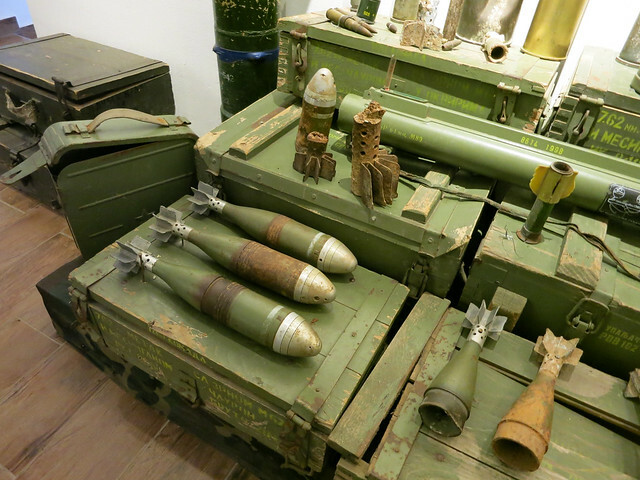 More evil war stuff. 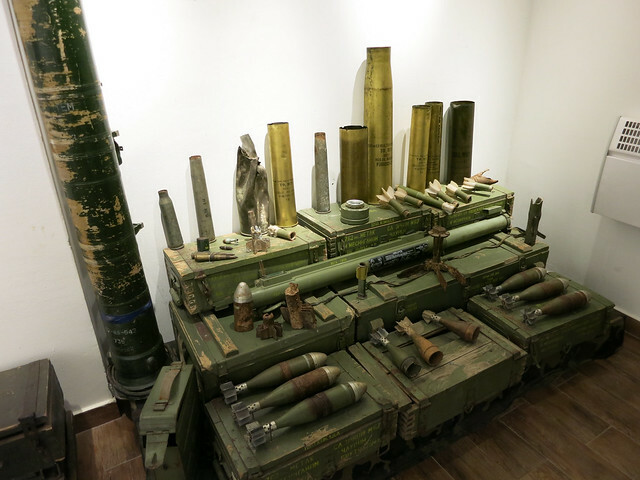 That’s a bazooka on the left. 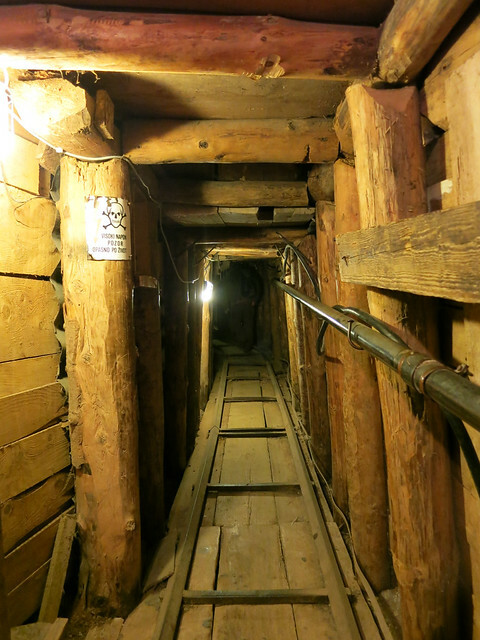 The Sarajevo Tunnel that provided access to the free territory near the Sarajevo Airport while the city was under siege by Serbian forces. 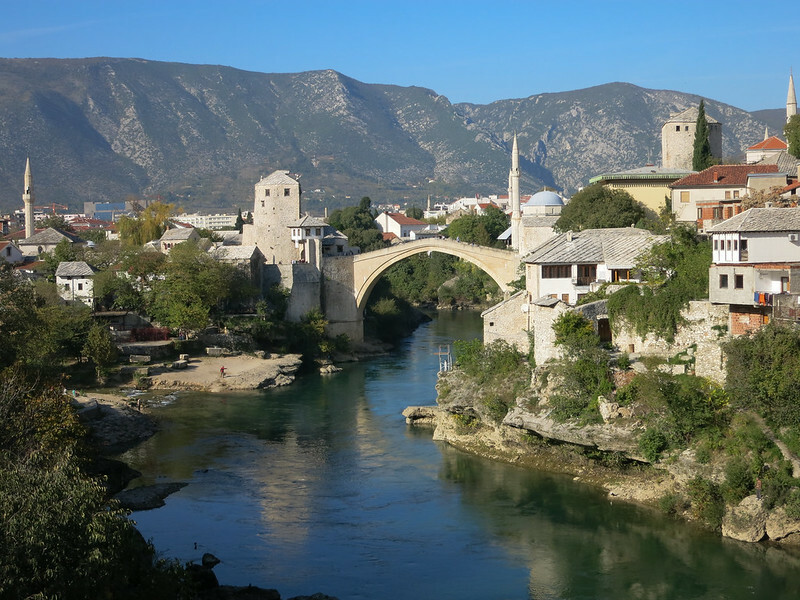 Stari Most – One of the most famous landmarks in Bosnia and Herzegovina. I’ve lived a very sheltered life. I’m so sheltered that even wars that have happened during my lifetime are just words on paper or images on screens that are about as real to me as a Bruce Willis action movie. 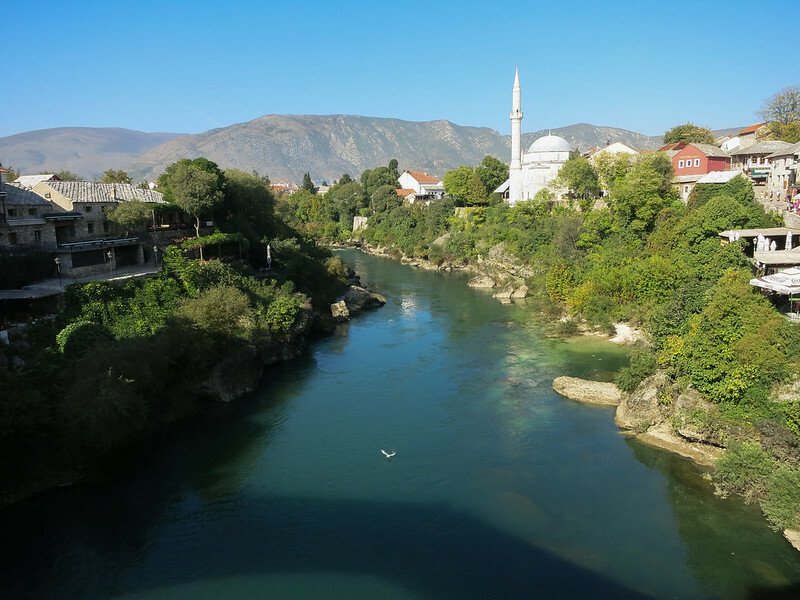 Being in Mostar made me realize just how lucky I’ve been. 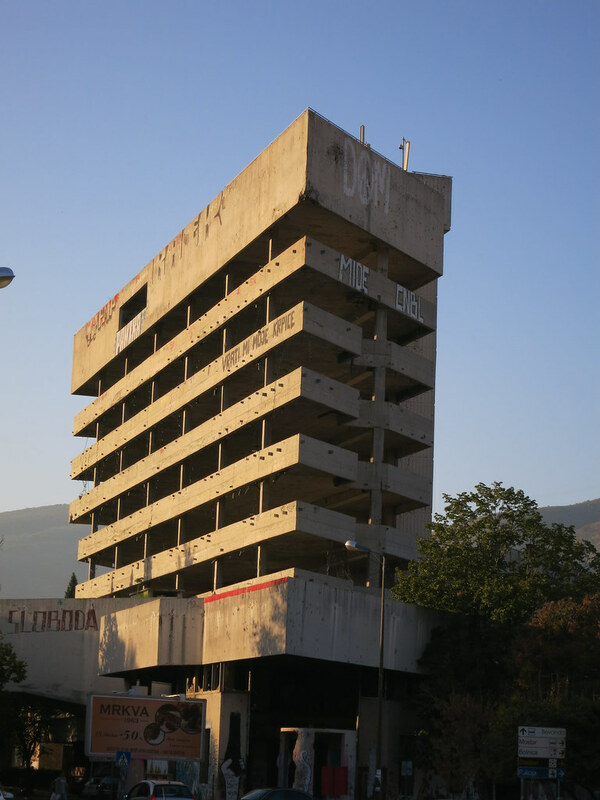 Based on our first post about Mostar, you probably have some idea of how recent their history of war violence is. 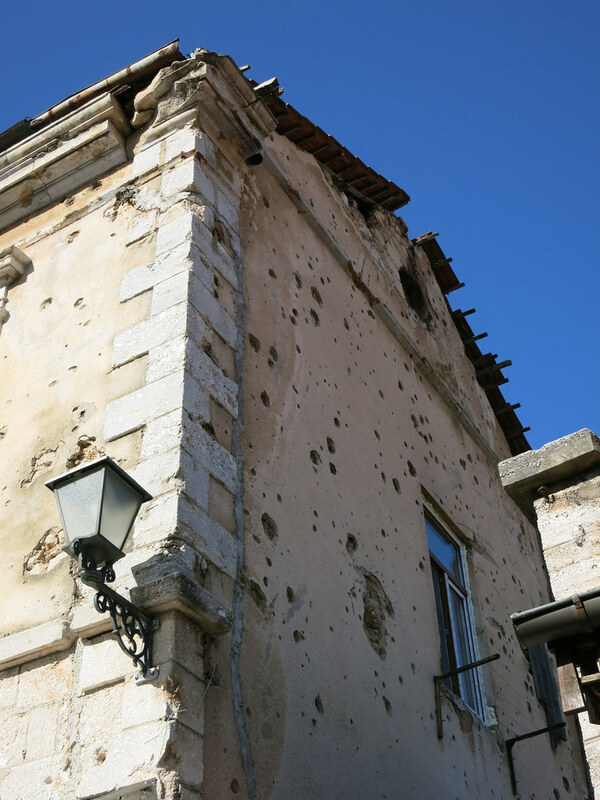 Besides the sniper tower, you can see numerous other remnants of war just by strolling around the city. 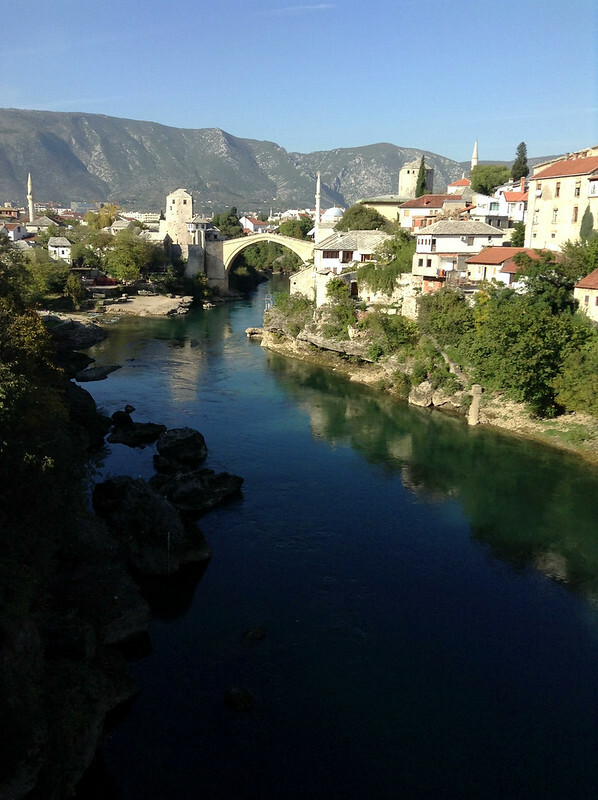 The most infamous one is probably the Stari Most. 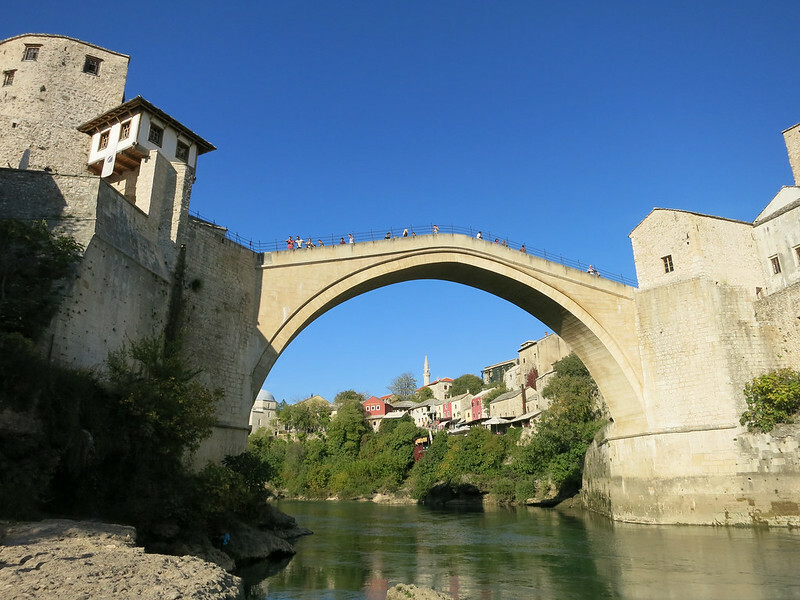 The Stari Most, Old Bridge in English, connects two parts of Mostar and is one of the most recognizable landmarks in the country. For such a simple looking bridge, it’s strangely captivating and I just couldn’t seem to get enough pictures of it. Every time I walked near it I had to snap a picture. Weird. 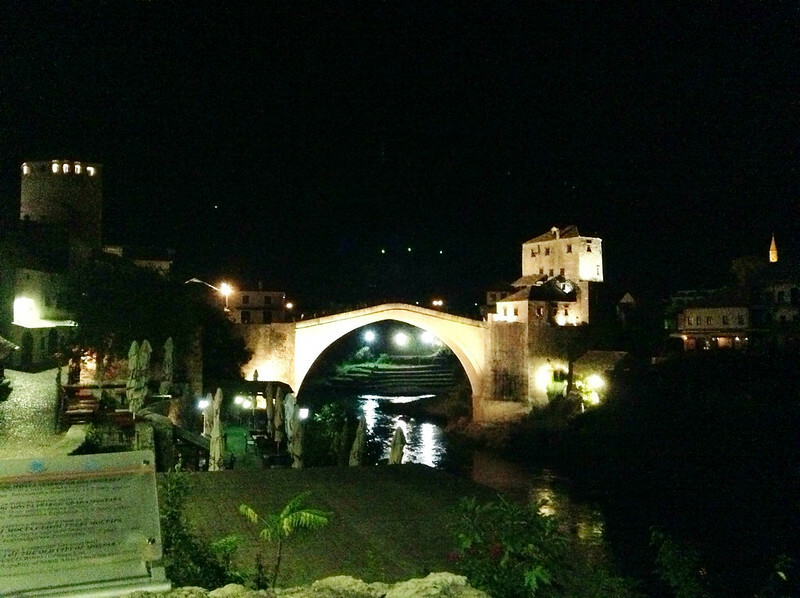 Stari Most at night. I’m telling you, this bridge has a strange power over my camera. The bridge that we see now is actually a reconstruction of the original that was built in the 16th century during the Ottoman Empire. It lasted for 427 years through many wars, but was finally brought down on November 9, 1993 during the Croat-Bosniak War. After the war the Croats admitted to deliberately targeting and destroying the bridge although their reason for destroying it, strategic importance, is highly disputed by academics who argue that the destruction of the bridge was symbolic since it represented the shared cultural heritage between the people who have occupied the city for so many years. 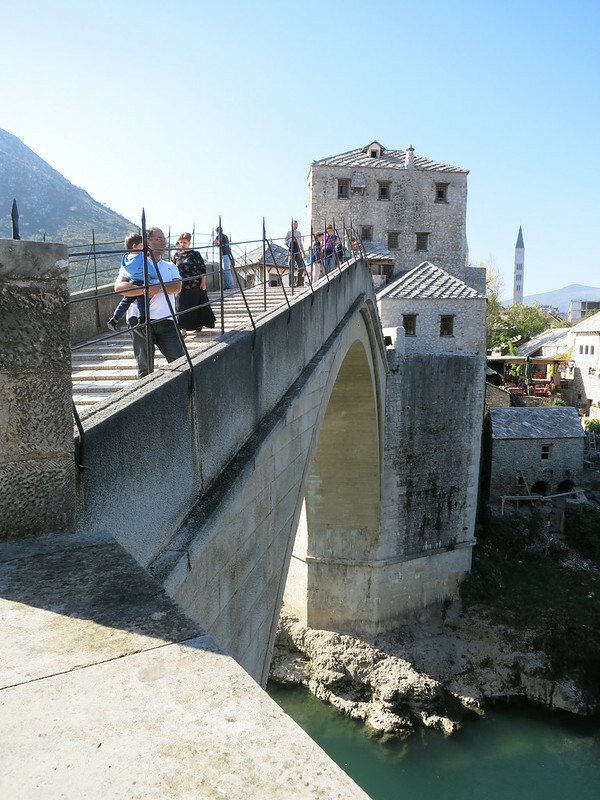 There’s a tiny museum in the old town area where you can learn more about the history of Mostar and the bridge if you’re interested. It’s free so you’ll probably go even if you’re not that interested. And, if you like to tempt death, there’s an annual diving competition in the summer where you can hurl your body from the bridge into the shallow, frigid waters of the Neretva River below. Don’t come crying to me if you die. 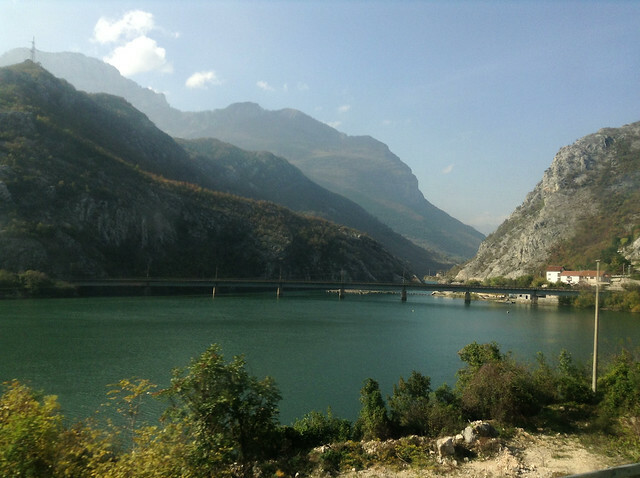 The Neretva River for your diving pleasure. An abandoned building, but still very much standing. I was 14 when the Bosnian War ended in 1995. I remember hearing about it, but it was a world so far removed from my world that I didn’t bother to learn about it. Later, we all heard and read about the genocides, the mass rapes and the ethnic cleansing that went on as the rest of the world turned their heads. It’s one thing to read about it and another to be in the places where these atrocities happened. 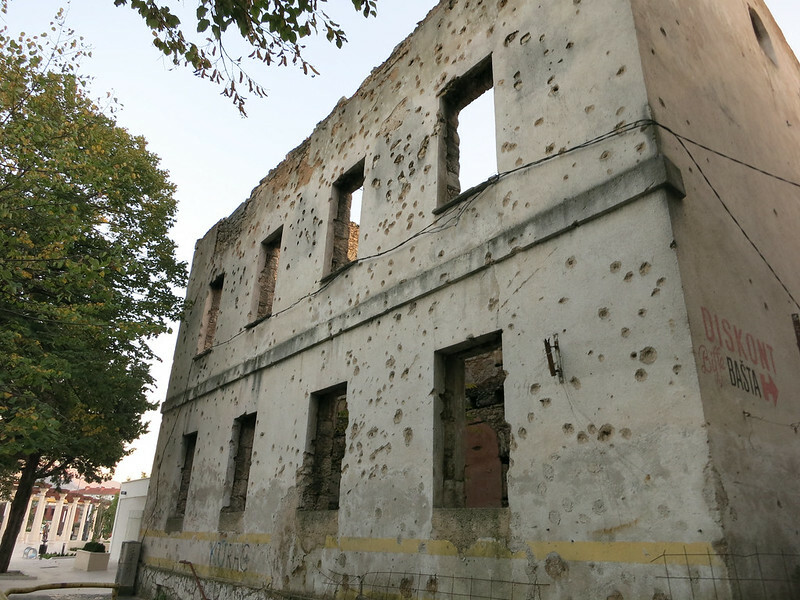 Bullet-ridden houses are everywhere you look. A gate and wall riddled with holes. 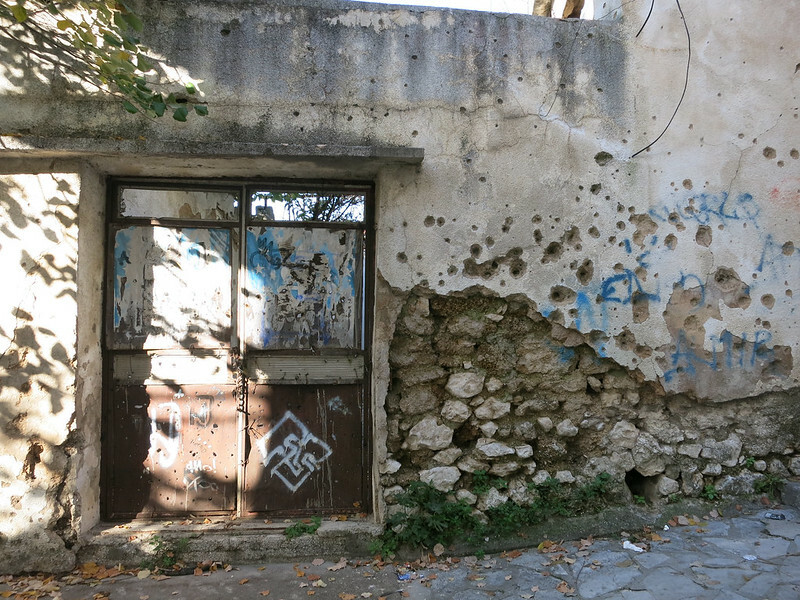 We occasionally came across abandoned, bullet-ridden houses in Croatia, but seeing the remaining damage in Mostar was shocking. Rows and rows of pock-marked buildings stood next to brand new ones as silent but sobering reminders of the war. 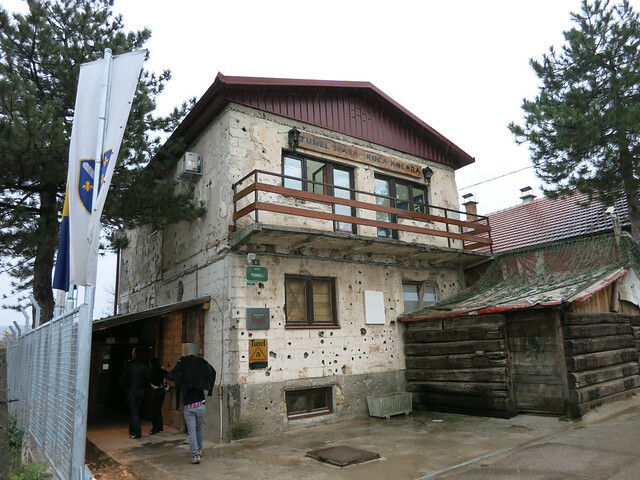 One especially notable place left over from the war is the “sniper tower”, a former bank building that was occupied by Serb and Croat forces. The “Sniper Tower”, or the old bank building. As we made our way to the sniper tower in the afternoon (before the junkies go to the building in the evening to get high), we ran into a traveling American couple we met at the bus station on our way to Mostar the day before. THANK GOD. We wouldn’t have to explore the creepy abandoned building by ourselves!